D.O.B 14/5/.97 Stavropol Stud, Caucuses, Russia. 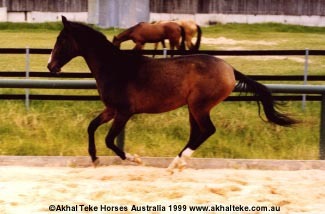 GRADING (to be done, too young when he left Stavropol Stud. He is going to be a big horse. He has settled into his new Australian home after a very arduous trip for a young horse. It took him over 6 months to get from Stavropol, Russia to the UK. He is well behaved and trusts people. He is getting better the more mature he becomes. He is extremely quick to learn. 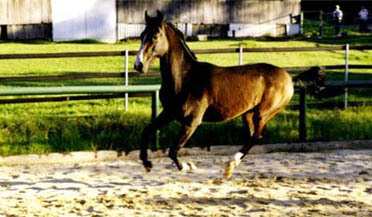 He has the "snake-like" trot of a ground covering Akhal Teke. 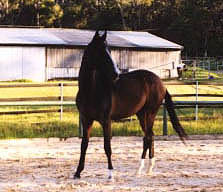 He is in training and should excel at dressage. 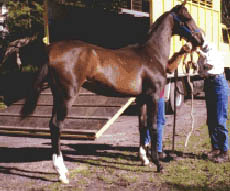 Decebal, the day he arrived at Timbarra Valley. 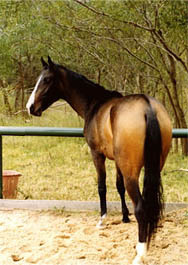 1999 Dark dun front end, bronze dun hindquarters.